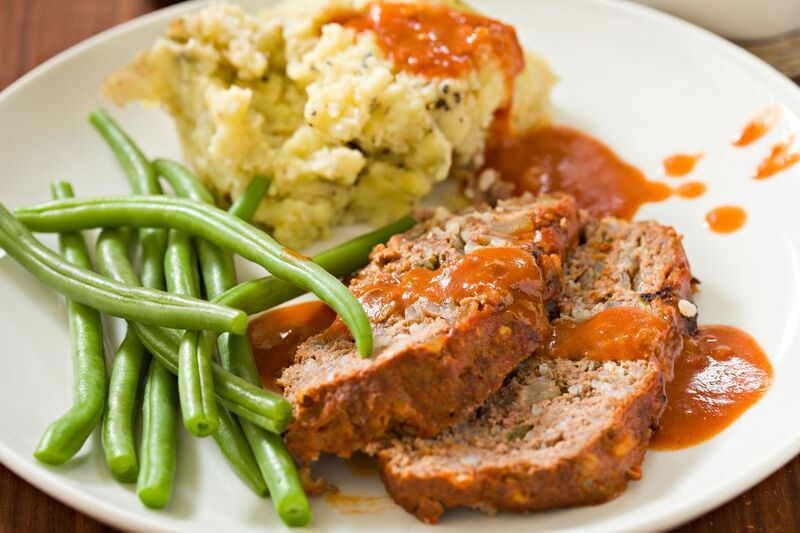 Meatloaf is such an easy dinner to prepare, and great for planning ahead. You can prep the meat up to the cooking step, wrap it up and store in the freezer for future meals. Another great thing about meatloaf is that the ingredients are typically inexpensive -- this is a meal that won't break your budget. Meatloaf is also one of those dishes that you can easily tweak and experiment with different spices and flavors. In this version, chile peppers transform this typically family-friendly meal into a fiery tongue tingler. Of course, if you'd like to make it milder simply remove the seeds and veins from the chilies. Finely mince the three peppers (use gloves to protect your hands and fingers -- hot peppers can burn!). Omit the seeds and veins if a less spicy meatloaf is desired. Preheat the oven to 350°F and prepare the loaf pan. In a large mixing bowl, combine the ground pork with the ground beef until the meats are thoroughly combined (Don't be afraid to use your hands!). Sprinkle the Italian seasoning mix (omit sea salt if seasoning mix contains salt already) over the meat, then use your hands to distribute the spices as best as possible throughout the meat. Set the bowl aside. Heat the olive oil in a hot pan. Once the oil is hot, add the finely chopped onion and sauté until softened. Next, add the finely minced peppers and the garlic cloves. Continue to cook until everything is completely soft and cooked through. Pour this chile-garlic mixture over the seasoned meat mix. Use a spoon or your hands (careful if mixture is still hot) to distribute the chile mixture throughout the meat. Pour in the eggs and milk, then add the breadcrumbs. Thoroughly mix into the meat and continue until everything is well incorporated. The meat should come together and stick together easily now. If needed, add a couple more tablespoons of breadcrumbs to bind meat together. Put the meat mixture into the loaf pan and use your hands or a spoon to pack the meat tightly into the pan and create an evenly shaped meatloaf. Use a wooden skewer or toothpick to prick a few small holes around the top of the meatloaf. Pour as much of the tomato soup as you can over the meatloaf, place the pan in the center of the oven and bake for 45 minutes. To test the meatloaf for doneness, insert a knife and make sure that the juices run clear. Allow to cool slightly before serving, and serve with your favorite side dishes -- green beans and either mashed potatoes or boiled potatoes round out this meal.